Despite her name, Clover has always felt decidedly unlucky. So when she stumbles upon a mysterious cottage in the Woods, she can hardly believe her good fortune. It's the Magical Animal Adoption Agency, and it houses creatures of all kinds. Fairy horses, unicorns, and a fiery young dragon are just the beginning! Mr. Jams, the Agency's owner, agrees to hire her as summer helper and Clover hopes her luck has finally changed. But when she's left alone to care for the Agency, a sneaky witch comes after the magical creatures! Will Clover outsmart her in time to protect the animals? 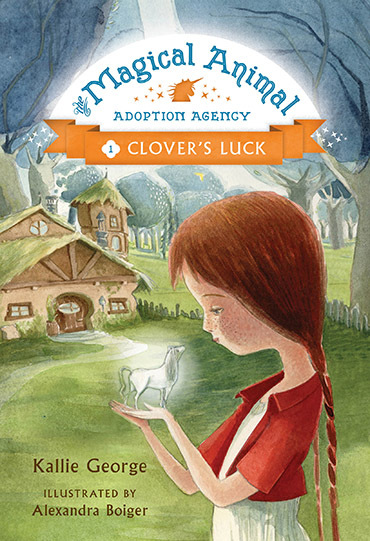 The first installment in a new illustrated chapter book series by Kallie George, featuring enchanting illustrations by Alexandra Boiger, will charm young readers as Clover learns that courage and heart can be even more powerful than good luck. 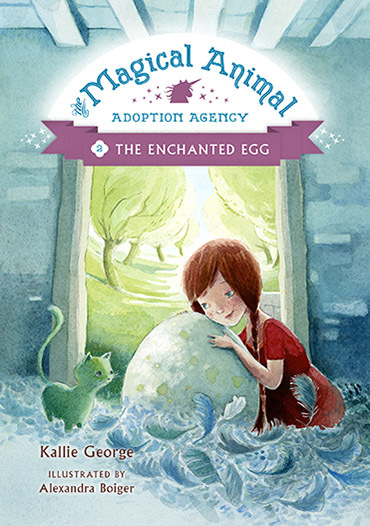 There's a new resident at the Magical Animal Adoption Agency—but this one hasn't hatched yet! Mr. Jams has brought home an enchanted egg from his last journey, and Clover can't wait to find out what kind of creature the polka-dotted shell contains. But one morning when Clover checks on the cozy nest of feathers she's made for the egg, she finds it empty, and the baby animal is nowhere in sight! Clover is anxious to find the creature, but the Agency is full of visitors looking for pets of their own. Will Clover be able to match them with their perfect companions and save the mysterious animal before Mr. Jams returns from his trip? When Mr. Jams is called away from the Agency on a secret mission, Clover and Oliver are put in charge of the Agency once again. But when Picnic the invisible puppy starts turning visible, and the Agency's green cat, Dipity, begins to look white, Clover and Oliver realize that all of the amazing creatures are becoming ordinary. Even Oliver's trusty magical wands aren't enough to cure them! Will Oliver and Clover learn to work together in time to restore the animals' magical powers? 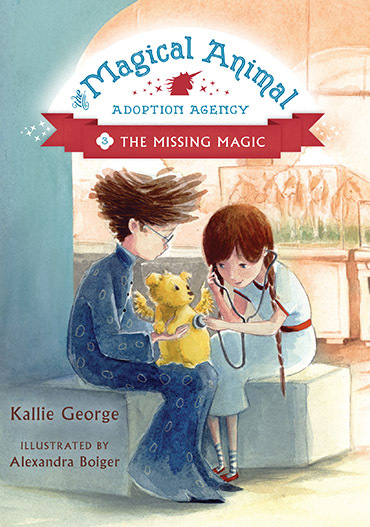 Alexandra Boiger's delightful illustrations shine in the third book of Kallie George's The Magical Animal Adoption Agency series where an open heart can best the nastiest of spells. Kallie George works as an author and editor in Vancouver, Canada, and she holds a master's in children's literature from the University of British Columbia. In addition to writing and editing, Kallie is a speaker and leads workshops for aspiring writers. She dreams of one day adopting a fairy horse. Visit her online at kalliegeorge.com. Alexandra Boiger grew up in Munich, Germany, where she studied graphic design, and then began a career in feature animation, allowing her to work for Warner Bros. UK and DreamWorks. After transitioning to children's book illustration, she has worked on numerous popular titles, including the Tallulah series. She lives with her husband and daughter in northern California. See more of her work online at alexandraboiger.com.